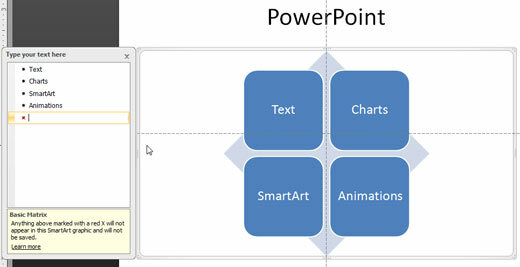 Excerpt/Capsule: This tutorial shows Text pane for SmartArt graphics in PowerPoint 2007. Although SmartArt contains text, it is not too easy to edit, add, or delete text contained within a shape inside a SmartArt graphic. Thankfully, the Text Pane available to edit text in a SmartArt graphic makes it a whole lot more intuitive! Related Link: Refer to the Convert Bulleted Text to SmartArt tutorial if you already have bulleted text that you want to convert to a SmartArt graphic. 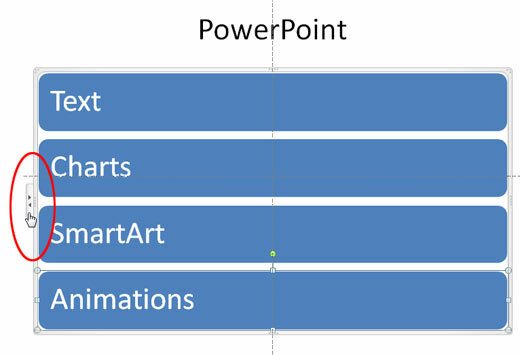 The Text Pane is usually visible when a SmartArt graphic is selected on the slide. 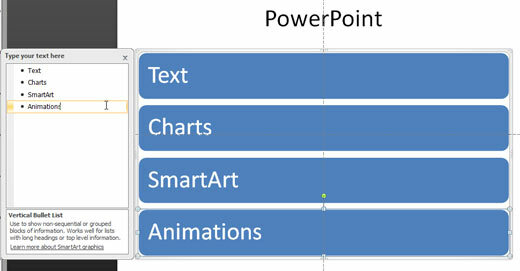 As you can see in Figure 1, the Text Pane appears on the left side of the SmartArt graphic. Sometimes you won't see the Text Pane even if you select the SmartArt graphic. In this case you'll see the bi-directional arrow button, as you can see in Figure 2. Yes, you can click this bi-directional arrow button to make the Text Pane visible as previously shown in Figure 1. Look at Figure 3 -- you'll find that the bottom part of the Text Pane displays information about the SmartArt graphic variant you are working with -- in a later tutorial I will show you how you can change from one SmartArt graphic variant to another. To create a new line of bulleted text in the Text Pane, just press the Enter/Return on you keyboard. Type text for the new bullet, and you'll see that your SmartArt graphic has a new shape representing the new bullet (see Figure 3). You can also format the text in the Text Pane by first selecting the individual text within the Text Pane. Then, carefully right-click to view the contextual menu and mini toolbar, shown in Figure 4. Note that the mini toolbar allows you to to change the font, font size, color, etc. within the Text Pane (and also within the Smart Art graphic). The contextual menu allows you to change the hierarchy of the selected text to previous or next bullet levels. 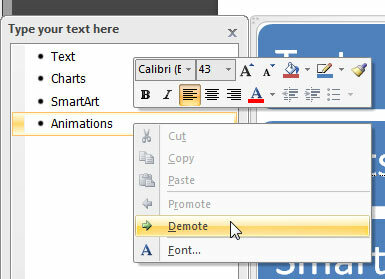 You do that by clicking either the Promote or Demote options in the contextual menu (refer again to Figure 4) -- do note that the Promote or Demote options may be grayed out in some instances -- their availability in the contextual menu depends on what type of SmartArt graphic variant you are working with. As we explained, in some instances you might find that the Promote and/or Demote options are grayed out -- they show up depending upon the SmartArt graphic variant being used. For example you cannot add a new bullet level, or even a demoted level to the Basic Matrix SmartArt graphic variant once you hit the limit of 4 first level bullets (see Figure 5). Some SmartArt graphic variants though let you add more bullets / shapes and are not as constrained as the Basic Matrix variant -- the Diverging Radial for instance lets you add many more bullets / shapes to an existing SmartArt graphic (see Figures 6).